Londoners are the poorest workers in Britain, according to new research, with the average worker barely left with £50 after all their outgoings are accounted for. Based on new roles advertised in Q3 2016, the job site revealed that the average annual salary in London is £37,408; just 13.2 per cent greater than the national average of £32,596 per year. However, further research revealed that premium costs in the capital drastically outweigh the slightly higher-than-average salaries, meaning Londoners have the least disposable income in the country. The results suggest that a worker in London could end up in serious debt if they want the same living standards as anyone else in the country, despite holding senior, well-paid jobs. To delve even further, when comparing the purchase of a one-bed flat in London, to a similar one-bed flat in Glasgow, the difference is significant. Whilst the average cost of a one-bed flat in Glasgow is £76,286, the same flat in London would be £550,764; six times more expensive (622%). However, when comparing average salaries in both cities (£37,408 in London and £33,417 in Glasgow), Londoners only earn 12 per cent more than workers in Glasgow. 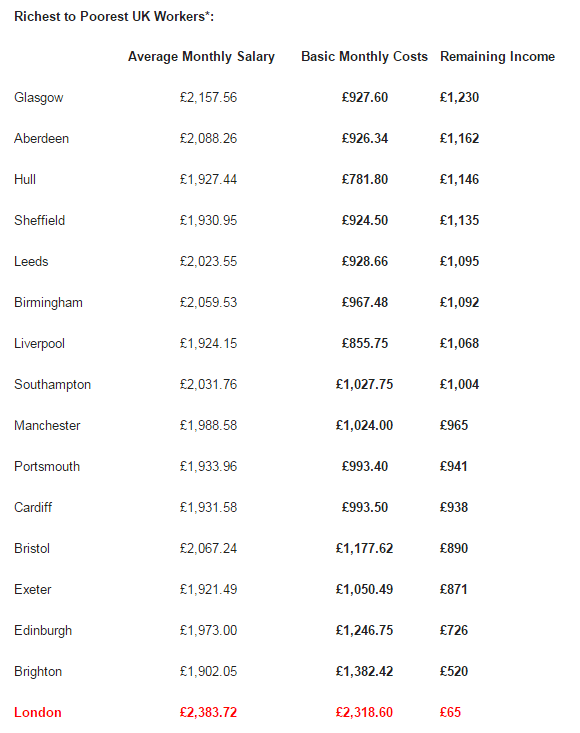 In real terms, a professional in Glasgow would spend 16.1 per cent of their salary on a mortgage for a one bed property and still have £1,810 left in their pocket to cover bills and other living expenses. A Londoner would need 105.2 per cent of their salary to pay the mortgage alone, leaving them in debt before they have even considered how to cover bills and other basic costs.